3 Bedroom End of Terrace House For Sale in Wadebridge for Asking Price £285,000. A superbly renovated, three bedroom stone fronted townhouse, situated in an excellent position for the town. The accommodation comprises a spacious lounge / diner with feature fireplace with an inset wood burner, cottage style kitchen and ground floor shower room. The first floor offers three bedrooms, two with exposed beams and a modern family bathroom. Complemented with double glazed sash windows, newly fitted gas central heating system, attached utility room / storage and parking for a single car with seating area. With No On-Going Chain and Immediate Vacant Possession. 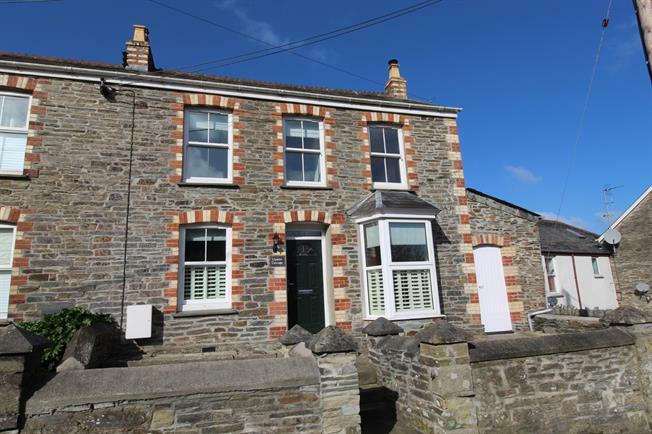 Believed to have been built circa 1870 is this charming three bedroom end of terrace property. The vendor has carried out extensive refurbishment of the property, including a full re-wire, gas central heating system, kitchen and bathroom suites, implementing a modern wood burning stove, whilst keeping some wonderful original features such as the slate flooring in the kitchen and exposing the beams upstairs. Externally, there is a lean to store room / utility to the right of the property, a courtyard and off road parking for 1 vehicle. Available chain free! Main solid composite door to the front. Double glazed uPVC bay window facing the front and further double glazed window. Radiator and a feature fire place with an inset wood burner, engineered wood flooring and under stair storage. Access to the kitchen / breakfast room and stairs ascend to the first floor. A modern shower suite comprising; double glazed uPVC window with obscure glass facing the side. Heated towel rail, flagged flooring, part tiled walls. Low level WC, walk-in shower, pedestal sink and extractor fan. Access to the bedrooms and family bathroom. Feature vaulted ceiling with exposed beams and uPVC Velux window. Double glazed uPVC sash window facing the front. Radiator, carpeted flooring, vaulted beam ceiling. Recess for wardrobe space. Dual aspect, double glazed uPVC sash window facing the front and side. Radiator, carpeted flooring. Access to the roof void. Double glazed uPVC sash window facing the rear. Radiator, carpeted flooring. Double glazed uPVC Velux window. Heated towel rail, tiled flooring, part tiled walls, vaulted beam ceiling. Low level WC, panelled bath with shower over, pedestal sink and extractor fan. A useful outside storage area attached to the property, which combines as a utility, space and plumbing for a washing machine and dryer. Gas boiler. The property is accessed to the front by steps and path to the main entrance. The front is of low maintenance and additionally to the rear, suitable for an outside seating area, potted plants and space for private off road parking. A viewing internally and externally is highly recommended.